With neutral palettes taking centre stage, it was only a matter of time before MAC came to their senses and released a couple of pre made palettes themselves. Earlier this year MAC released two pre filled neutral palettes consisting of 15 eyeshadows, 1 warm toned and 1 cool toned, both of which are permanent. When I saw that these palettes had been released online, I was excited. As a devotee of MAC eyeshadows there was no doubt in my mind that I had to get the warm neutral palette. I didn’t even question my need for any more eyeshadow (defiantly not necessary). I was sold. Sold not only because MAC eyeshadows are possibly the best of the best, but also the fact that in the palette, there are shades which, at this time, are exclusive to the palette. And I’ll admit now, that I’m that girl that likes to sit down and attempt to recreate eyeshadow looks as seen on youTube, Instagram, Pinterest and from my latest glossy magazine and layer shadows, create looks and get creative. So I parted with the £49.50 and bought it. And I will be honest and say I very rarely walk away from a MAC counter having spent less than that. And I don’t regret my purchase! I already own a 15 pan MAC palette which takes pride place on my dressing table and has become my most loved piece of makeup. I must say if the house set on fire and I could only have one thing from my makeup collection, it would be my MAC palette! You can read all about my MAC palette here. 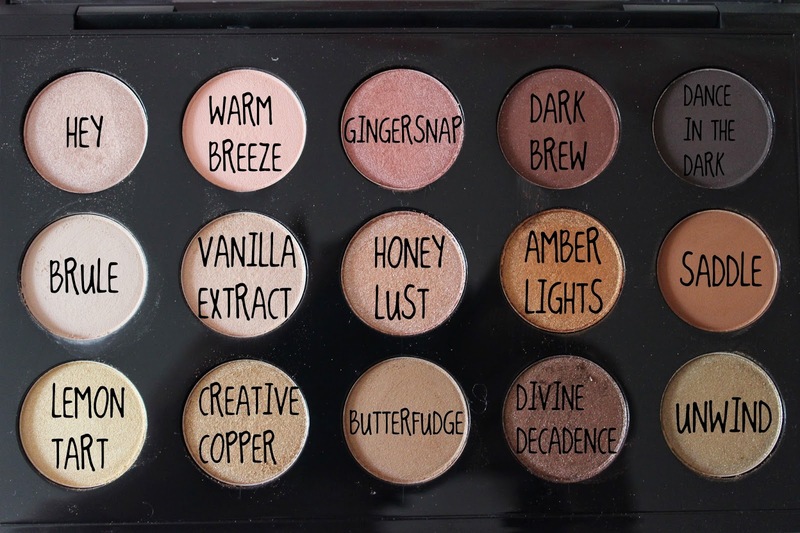 Mac eyeshadow finishes are also explained in this post. This palette is in no way, a copy of any of the Urban Decay Naked palettes. Urban Decay did not create neutrals ladies! In this warm toned palette, there are four permanent shades and four repromoted shades (ones that have been released previously as limited edition shades). The one negative I have about this palette is that unfortunately the pans are glued in, which to me seems a little silly, especially as it might encourage people to go back into store and buy another pan to replace another etc. But I’m sure with a bit of elbow grease and heat this can be resolved. Maybe if more of us kick up a fuss they might change this. And also just a side note, this is not a travel friendly palette, but if like me you couldn’t care less, your onto a winner! Hey (Veluxe Pearl): is a “metallic coral" (Repromote). Hey is a light muted coral and it's creamy, and buildable. Colour payoff is good and the finish is buttery smooth. If you like MAC Naked Lunch you will like Hey. Warm Breeze (Satin): is a “pastel coral”. This shade is almost matte and has tiny little flecks of glitter. Gingersnap (Frost): is a “deep rosy pink”. This eyeshadow is rustic looking and has fab colour pay off! I love this shade and I have been wearing it with creative copper layered over the top. Dark Brew (Velvet): is a “deep chocolate with pink pearl”. This mid-town brown is really pretty and has scattered pink shimmer running through it. It reminds me of blackheart from the UDN3 palette in terms of the dark colour with coloured shimmer. 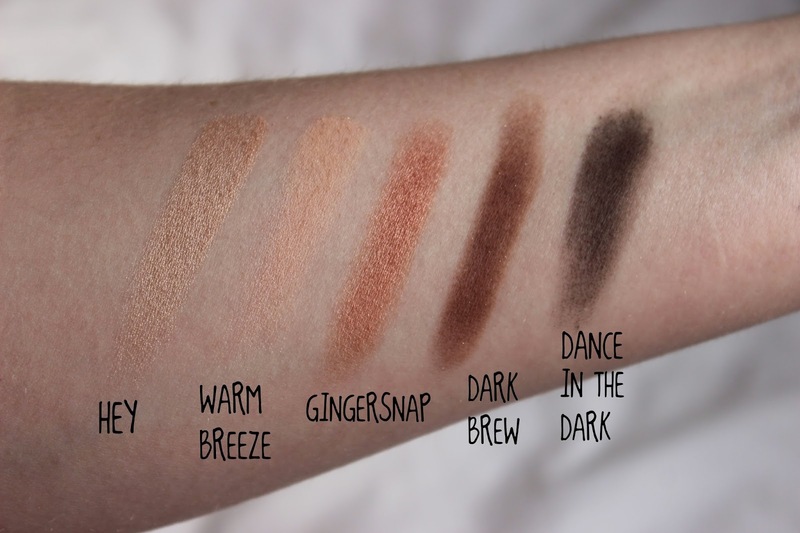 Dance in the Dark (Matte): is a “dark brown” (Repromote). Every palette needs either a black or a dark brown to create a smoky eye or to line the upper lash line. Brule (Satin): is a “soft creamy beige" (Permanent). This is the one shade in the palette that I already own. I like to use this shade all over my lid to neutralise it from any redness or veins. 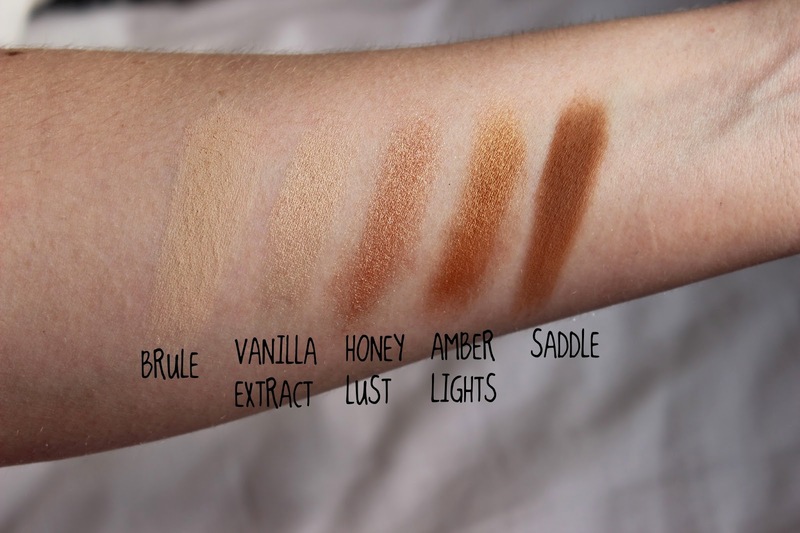 Vanilla Extract (Frost): is a “soft warm yellow beige" and out of all the eyeshadows has the worst colour pay off. For me although I still wear it, it was a little disappointing as I own Vanilla Extract Pigment and thought it might be similar. Honey Lust (Lustre): is a “bronze-dipped peach" (Permanent). I have been getting a lot of wear our of this shade although it does have a little fall out. The colour pay off is buildable and it is a really pretty shade. Amber Lights (Frost): is a “peachy-brown with shimmer" (Permanent). Another new found love! If you have blue eyes and don’t fancy buying this palette, I highly recommend getting your hands on this shade! Amber Lights is very smooth and has great great colour payoff. Saddle (Matte): is a “golden orange brown" (Permanent) and is described as one of the best transition colors ever. Lemon Tart (Veluxe Pearl): is a “metallic gold”. It is a muted yellow gold and has good colour pay off and is soft and smooth in texture. Creative Copper (Lustre): is a “frosted gold" (Repromote). This shade does have a little fall out, but really pretty especially when worn over the top of other colours in the palette. This eyeshadow is very similar to ‘Burnished Gold' from the Body Shop summer cubes palette 30. Butterfudge (Satin): is a “dirty mocha with gold pearl”. Although this eyeshadow doesn’t look all that exciting in the pan (rather like Mac’s ‘Patina’ eyeshadow) it is actually a really lovely muted brown. Divine Decadence (Velvet): is a “soft bronze" (Repromote). This shadow has red-orange undertones and is a pretty dark bronze shimmery brown. 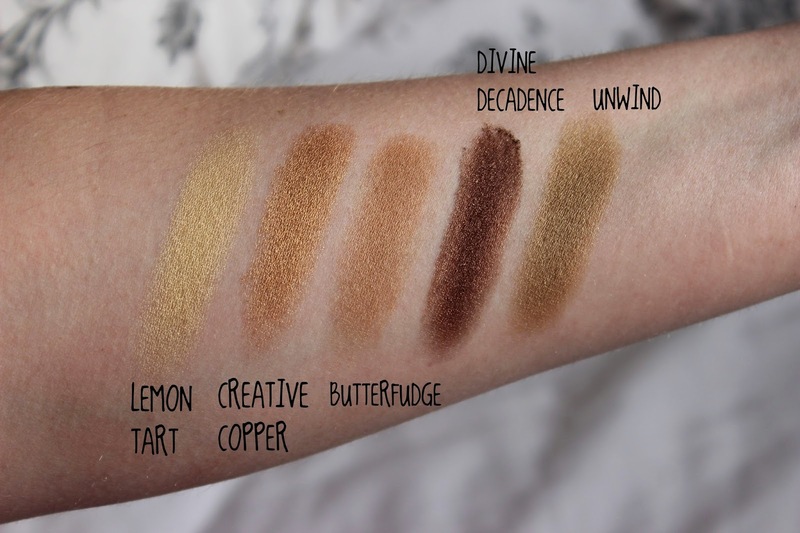 This shadow has an odd texture rather like when you layer a cream eyeshadow and it goes a little dry and gritty. Unwind (Veluxe Pearl): is a “dirty olive”. This eyeshadow is a muted shade. And in all honestly isn’t a shadow I would pick if I was in store, but this shadow is actually a lovely colour! If ‘Patina' and 'Sumptuous Olive' by MAC had a baby this would be it! If you are looking to build your own MAC neutral palette and have the budget, this palette is far more cost effective as completing your own would cost you £170.50, need I explain any further? For me this palette is like a blue eyed dream. Great colour combinations for bronzed and golden eyes. With every shadow being buildable, blendable and smooth. There isn’t one dud shade and I know I will get use out of every single colour - being that girl and all! Do you own either of the pre filled palettes?